Pottery Avenue's sweet little Z C BOLESLAWIEC polish 6.1” stoneware serving spoon is great for jams, jellies, and what ever your needs are. Featured in “BUTTERFLY MERRYMAKING“, the eye-pleasing appearance of this Polish Stoneware makes it a wonderful addition to your cutlery collection as it promises an intriguing blend of form, function and timeless elegance. Pottery Avenue's sweet little Z C BOLESLAWIEC polish 6.1” stoneware serving spoon is great for jams, jellies, and what ever your needs are. 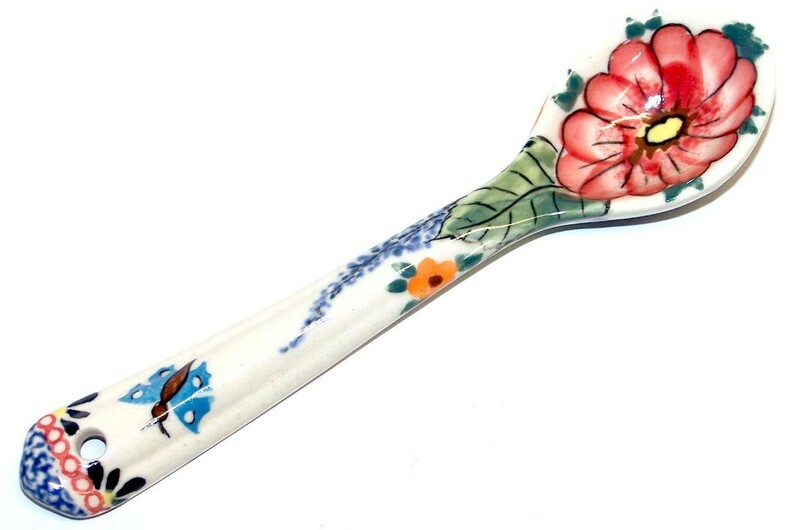 Featured in “BUTTERFLY MERRYMAKING“, the eye-pleasing appearance of this Polish Stoneware makes it a wonderful addition to your cutlery collection as it promises an intriguing blend of form, function and timeless elegance. The pattern of this stoneware exemplifies the brilliance of Polish artisans to create an impressive design.Designed by top designers and imported by Pottery Avenue, the premier importer of Polish Pottery and Polish Stoneware. The UNIKAT design, Butterfly MerryMaking has vibrant red, blue, green, orange floral motif coming alive on this piece and brings a never ending bouquet to any table or counter top. The highly decorated design is from the UNIKAT collection and is more limited in production and more exclusive. *Microwave, oven, freezer and dishwasher safe. *Stoneware must be room temperature prior to use in a microwave or hot oven.